Gagarin’s contribution to space exploration was lauded by numerous representatives of India’s scientific community. A postage stamp in honour of Yuri Gagarin’s 80th birth anniversary was presented at the Russian Centre of Science and Culture (RCSC) in Trivandrum on Sunday, March 9. 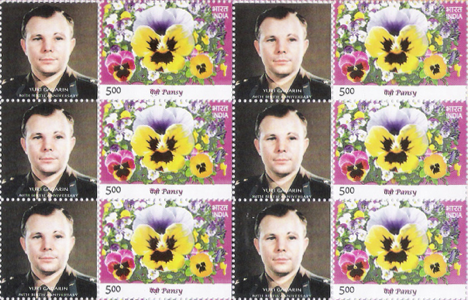 It is adorned with a photo of the first cosmonaut and with flowers. The contribution of Yuri Gagarin to space exploration was lauded by numerous representatives of India’s scientific community. Udupi Ramachandra Rao, former Chairman, India Space Research Organisation (ISRO) said Gagarin made dreams to discover the world of stars and galaxies come true. “Gagarin's space flight was the most significant revolution in the journey of mankind after the agricultural and industrial revolution, Rao was quoted by Itar-Tass as saying. According to Nair, Gagarin's endeavour paved the way, and in the next decades space flights will be as common as air travel. “Gagarin's journey in Sputnik also inspired the Indian scientific community. We submitted a report for Indian manned moon mission when I was Chairman ISRO. Due to some administrative and political reasons it could not take place yet, but the day will come when this dream of ours will also be realized,” he added.